The ruling Democratic Party on Friday expressed hope that a new inter-Korean summit could pave the way for North Korea and the United States to make progress in Pyongyang's denuclearization. The two Koreas will hold high-level talks Monday to discuss preparations for a new meeting between their leaders as both sides agreed in April to hold a summit again in the fall. President Moon Jae-in held his first summit with North Korean leader Kim Jong-un on April 27, followed by another one on May 26. North Korea and the United States held a historic summit in June in Singapore, but progress over resolving the North's nuclear problems have been slow as Pyongyang wants a declaration to end the 1950-53 Korean War to be done before its denuclearization. 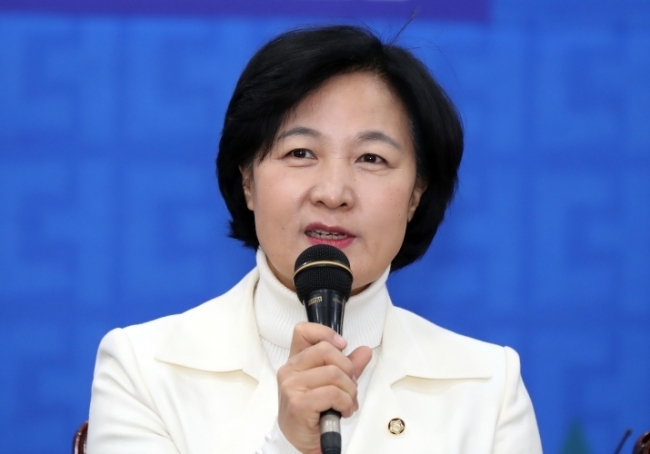 "We hope that (a new inter-Korean summit) could serve as a breakthrough at a time when the North and the US are wrangling over which should be prioritized between denuclearization and a formal end to the war," Choo Mi-ae, the chairwoman at the DP, said at a meeting with senior party members. She also voiced hope for better inter-Korean exchanges, driven by vibrant sports exchanges. The Koreas' workers will hold friendly football matches on the weekend. Seoul approved a trip by a group of young athletes to North Korea for their participation in international youth soccer games in Pyongyang next week. They will travel to Pyongyang via a western land route.